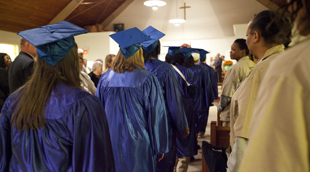 More than 40 women traded in their khaki uniforms for blue graduation caps and gowns on April 10, as they graduated from the Certificate in Theological Studies (CTS) program at Arrendale State Prison in Alto, Georgia. A collaborative project of the Atlanta Theological Association (ATA), which includes Candler School of Theology, the program prepares incarcerated women to serve as leaders and to develop their critical academic skills through a program of theological education. The new advanced certificate was made possible by a grant to the ATA from The Arthur Vining Davis Foundations. Zappa says that many women who have participated in the CTS program have expressed a desire to continue their studies after graduating, citing limited opportunities for higher education behind bars. The advanced certificate addresses that need, while also providing seminary and doctoral students at the four ATA schools with teaching opportunities. Dr. Thomas Fabisiak is the coordinator and academic advisor for the advanced certificate program. Candler has been instrumentally involved in the CTS program since its inception. Dr. Elizabeth Bounds, Candler associate professor of Christian ethics, and prison chaplain the Rev. Susan Bishop 75T co-founded the program in 2009, after more than a decade of planning. One very well known and beloved beneficiary of the CTS program is Kelly Gissendaner, the only woman on Georgia’s death row. 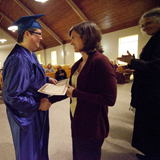 Gissendaner completed the program in 2010 and was selected as a speaker at the CTS graduation ceremony. In the days leading up to her scheduled execution this past March, countless members of Candler’s community rallied support around Gissendaner, organizing a petition to Gov. Nathan Deal to stop the execution, holding prayer services on Candler’s campus, and attending public vigils. Gissandaner’s execution was postponed indefinitely due to concerns about the quality of the drug to be used in the lethal injection, and Georgia has since put a temporary moratorium on all executions as the state determines the safety and effectiveness of its execution drugs. The Arthur Vining Davis Foundations is a national philanthropic organization that provides financial assistance to educational, cultural, scientific and religious institutions. For 40 years, the Foundations has supported theological education on a national level, in an effort to strengthen the preparation of pastors and lay leaders of traditional faith communities, and to develop interfaith leadership and religious literacy.